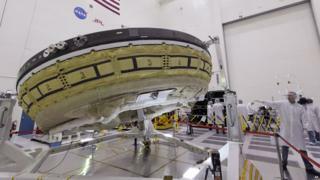 Space Agency Nasa is testing a flying saucer-type spacecraft that it hopes could one day land on Mars. 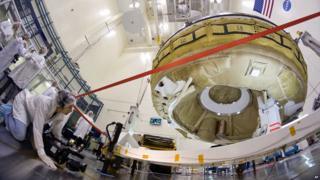 Nasa is planning more test flights for next year before deciding whether to use the new parachute on a future Mars mission. 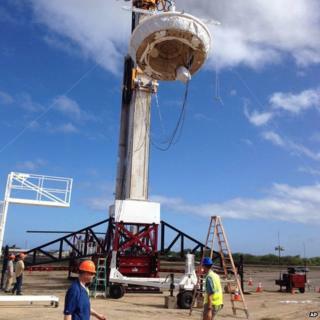 It's called a Low-Density Supersonic Decelerator (LDSD) and Nasa is planning a test flight for it in the skies near the American island state of Hawaii on 3 June. 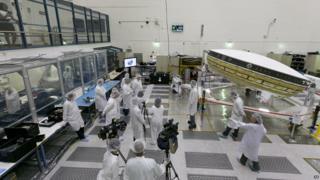 They'll test it high in the Earth's atmosphere because the air there is like the thin air on Mars. In the past, robotic landers and rovers have gone to Mars using the same parachute design. But with plans to land heavier spacecraft and eventually humans on Mars, Nasa needed a new method. It might look like a giant doughnut, but this is a vehicle that Nasa hopes could one day land on Mars.